as co-stewards of human and environment resources. are rooted in faith, love and justice. of faith and love; equity and justice. The cross that cuts the frame into four sections represents Faith, which is the true center and foundation upon which stand all that Assisi does and aspires to accomplish. The dove with a leaf stalk on its beak is symbolic of Justice, Peace, and Development, which are the very principles that guide all Assisi projects, partnerships, and initiatives. The images of a book and a tongue of flame held aloft over it speak of how ADFI’s work is directed towards education and capacity building on all levels of its various developmental projects and in every partnership that the foundation engages in. Representing ADFI’s commitment to the development of Filipino indigenous peoples and the environment is the image of an offering, depicted by two open hands and the lifting up of a leaf and a water drop, which themselves stand for the importance of partnerships in the work of the foundation. The symbol of three human figures traversing the surface of a curve represents Assisi’s focus on empowering people, especially Filipino families and communities, towards responsible adaptation in the face of a constantly changing environment. The picture also signifies ADFI’s dedication for the welfare, specifically the health and nutrition of poor and underprivileged children across the Philippines. 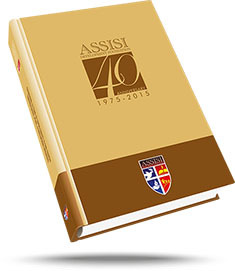 The brown color motif surrounding the foundation’s name depicts St. Francis of Assisi, as the inspiration that led to the establishment of ADFI and the guiding spirit at work in the heart of every member of Assisi as an organization. The colors of the Philippine flag – blue, red, yellow, and white – symbolize ADFI’s commitment to the development of the Filipino people, most especially the empowerment of the marginalized, the voiceless, and the neglected. The warm colors of red and yellow speak of the loving service that directs all ADFI projects and partnerships, while the color blue symbolizes Assisi’s vision of a lasting peace and well-being in the Philippines and around the globe.